OfficeServ 7200 Business Phone Systems Albany NY | Samsung Phone Systems Albany | Allied Telcom | Allied Business Systems	| Allied Business Communications, Inc. Welcome to the world of convergence. 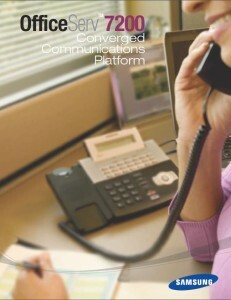 Not just the convergence of voice and data, but also the convergence of wired and wireless communications. The convergence of wired and wireless communications gives you the full functionality of traditional communications platforms plus the convenient, efficient, nonstop access that wireless appliances provide. Additionally, the convergence of voice and date on one integrated platform provides an efficient and cost-effective solution for your enterprise communication demands. Truly, this new world of convergence draws on the best of both worlds – for more efficient, more flexible, more complete enterprise communications.